Crash test dummies representing an average-sized adult male and a small-sized adult female are placed in the driver and rear passenger seats (driver’s side), respectively, and are secured with seat belts. The side crash rating represents an intersection-type collision by having a 3,015 pound (1367kg) barrier moving at 38.5 mph (62km/h) into a standing vehicle. The moving barrier is covered with material that is crushable to replicate the front of a vehicle. One star is the lowest rating; five stars is the highest. More stars equal safer cars. (!) After the frontal impact barrier test, 20 oz. of fluid leaked from the fuel system during the static rollover test. A fuel leak can be a fire hazard. 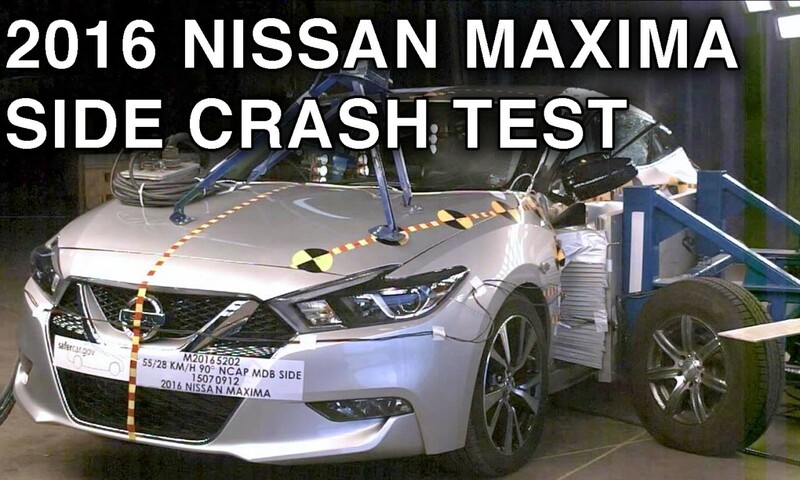 Posted On September 3, 2015 in Maxima, Nissan with 0 Comments.Tagged: 2016, Cars, crash, Crash Test, Maxima, NCAP, NHTSA, Nissan, Nissan Maxima, safety, test.